The Official History of the U.S. Army in World War II describes the action at Hill 351 as one of several “unheralded skirmishes.” To the men of the 15th Regiment, the fight was a life and death struggle. On a cold, dark December morning in 1944, B Company, 1st Battalion, 15th Regiment began the slow ascent up Hill 351. Coming under heavy machine-gun and artillery fire from a well-entrenched enemy, these soldiers of the U.S. 3rd Infantry Division were forced to dig in. First Lieutenant George W. Mohr, commander of B Company, remembered the struggle: “We were pinned down by snipers and heavy machine gun fire; if you dared to lift your head up, you were dead.” Mindful that the hill had to be taken at all costs, Lt. Col. Keith L. Ware, the battalion commander, decided to take matters into his own hands. Shouting words of encouragement as he strode up and down the firing line, Ware steadied his weary men, invigorating them to fight on despite continuing artillery fire. His bold leadership and icy courage were pivotal in clearing the enemy and securing the hill. The story of the hill’s capture had begun a week earlier, on December 17, 1944. The 3rd Infantry Division, which consisted of the 7th, 15th, and 30th Regiments, started its move south from Strasbourg, France, to relieve the 36th Infantry Division in the Colmar region. The 3rd Division’s first objective was to secure the towns of Bennwihr and Sigolsheim. These were the last two significant towns between the American lines and the key city of Colmar. Both towns were located at the extreme western edge of the Alsace Plain and just east of the last high slopes of the formidable Vosges Mountains. Securing the towns would prove to be a difficult challenge because the Germans had heavily fortified the entire area, including the high ground surrounding the settlements. One of the obstacles to the Allied advance was a German bastion called Hill 351, a steep mound that would bear witness to some of the most courageous fighting of the Colmar campaign. 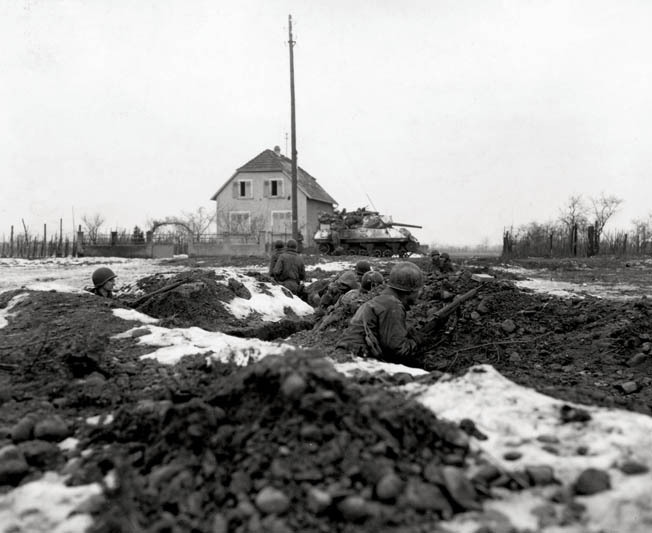 The 1st Battalion, 15th Regiment drew the unenviable assignment of capturing the town of Sigolsheim, a key German stronghold that had to be taken at all costs. Sigolsheim was an anchor of the enemy line on the northern perimeter of the Colmar bridgehead. Even though the town had been battered by artillery fire, the Germans had burrowed deeply into the rubble and continued their fanatical resistance. At 7:30 am on December 23, the 1st Battalion attacked Sigolsheim in the east, from the direction of Kientzheim, and met stiff resistance. Machine-gun and small-arms fire were encountered just before entering the town. A Company fought its way into Sigolsheim but took heavy fire from buildings and foxholes. A German counterattack from Hill 351 to the north stymied the Americans, who realized that holding the town would be a difficult proposition. Intent on eliminating the harassing interference from Hill 351, A and C Companies attacked up the northwestern slope of the hill on the morning of December 24. A Company, commanded by Captain Elmo F. Tefanelli, reached the top twice but was badly disorganized by concentrated mortar and artillery fire. The Germans counterattacked, forcing the Americans to withdraw to the base of the hill. C Company, under the command of Captain Samuel H. Roberts, took up the fight and succeeded in reaching the northeast slope of the hill by noon. Both companies were compelled to dig in and consolidate their limited gains. 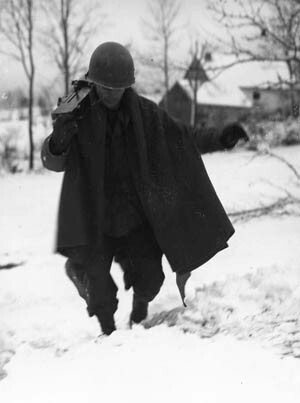 The men of the 1st Battalion fought in the snow for possession of the rocky hill throughout Christmas Eve and Christmas Day, suffering heavy casualties. As Christmas night came to an end, Hill 351 still remained in German hands. However, the “Can Do” Regiment was not about to concede the hill to the enemy so easily. Early that Christmas morning, Lt. Col. Ware had ordered B Company into position for an attack on Hill 351, to commence at 5 am the following day. During this action, Ware’s small assault group was fully engaged in attacking enemy positions. On the morning of December 26, B Company began an agonizingly slow advance up the hill and began taking heavy artillery and mortar fire almost immediately. Soon the attackers were engaged in a terrific firefight with a well-entrenched enemy. Throughout the morning, Mohr and his weary men inched slowly up the hill. Shortly before noon, B Company approached the crest of the Hill 351 but encountered fierce and accurate artillery and mortar fire once again. The men of the 1st Battalion fought in the snow for possession of the rocky hill throughout Christmas Eve and Christmas Day, suffering heavy casualties. At approximately 2 pm, Ware decided that a vigorous display of leadership was required. “After Lieutenant Colonel Ware returned to the battalion, he went from foxhole to foxhole trying to inspire us to attack. He then armed himself with an automatic rifle and led a handful of men and a tank in a daring assault on six enemy machine gun positions at the top of the hill. It was the most incredible thing I ever saw,” Weinberg later recalled. As soon as Ware and his men headed up the hill, enemy machine-gun fire converged on them from hidden positions. With bullets ricocheting off the rocks beside him, Ware boldly moved forward ahead of his men. Advancing calmly under fire, he approached to within 20 yards of the first enemy machine gun and shot two German riflemen. He then indicated its position to his tank by firing tracer rounds into the emplacement, enabling the tank to promptly knock the gun out of action. Turning his attention to a second machine gun, Ware advanced 50 more yards through furious fire and killed two of its supporting riflemen. Again, his tank silenced the gun. Having expended the rounds for the BAR, Ware took up an M1 rifle, killed another German soldier, and fired upon a third machine gun nearly 50 yards away. Once his tank destroyed the position, he charged toward a fourth machine gun and fearlessly engaged it, forcing German soldiers in supporting trenches nearby to surrender. During this action, Ware’s small assault group was fully engaged in attacking enemy positions. Five of the 11 men became casualties. Ware was wounded in the hand but refused medical attention. For his actions on Hill 351, Ware later received the Medal of Honor. Although the German defensive positions were significantly compromised, they still controlled the hill. When Ware got back to battalion headquarters, he called Lieutenant Mohr and ordered him to organize his company in preparation for the final assault. 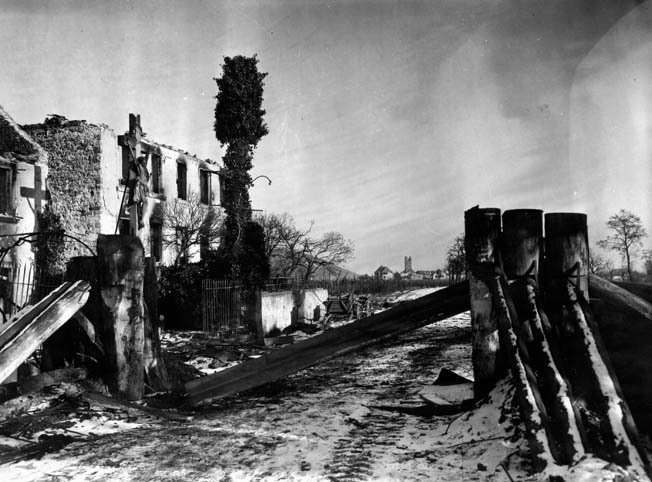 The barricaded and bombarded remains of Sigolsheim after the action on Christmas day. The Official History of the U.S. Army in World War II describes the action at Hill 351 as one of several “unheralded skirmishes.” To the men of the 15th Regiment, the fight was a life and death struggle. They had fought valiantly to dislodge a well-entrenched force of 200 battle-hardened German troops. In the end, the regiment seized a position that the enemy had been ordered to hold to the death. First Lieutenant Eli Whiteley of L Company received the second 1st Battalion Medal of Honor for heroism on December 26, 1944. Lieutenant Colonel Keith L. Ware eventually was promoted to the rank of major general. He was killed in action 25 years later, while commanding the 1st Infantry Division in Vietnam. Tags Allies, Alsace, Axis, Battle of Sigolsheim, battle of the Colmar Pocket, Browning Automatic Rifle, Colmar Region, European Theater, Hill 351, Keith L. Ware, medal of honor, Nazi Germany, U.S. Army, Waffen-SS.